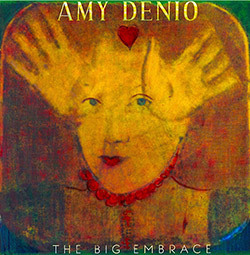 I wasn't very familiar at all with Denio's music, having heard her in several ensembles in the late 80s and early 90s but nothing since then, so I came to this recording with a reasonably blank slate (and have no idea how it compares to her previous work which comprises twenty or so releases under her own name). There are sixteen songs, most of which handled by Denio on her own, often overdubbed, using voice, bass guitar, clarinet, guitar, percussion and other instruments, occasionally augmented by other musicians, mostly voice and percussion (plus viola on one track by Hahn Rowe, another name I hadn't heard in ages). To my ears, references abound, not necessarily a bad thing. The opening track, 'L'Abbraccione (The Big Embrace)', has a very attractive chord sequence that carries echoes of 'Can't Find My Way Home' but, more, recalls Julie Tippetts' brilliant album, Sunset Glow. It's a lovely, undulating work, finding a slightly Middle-Eastern groove and riding it. 'Romadame' has a late 80s, NYC feel (think Curlew or Skeleton Crew) with effectively sung/spoken vocals in a beat-like manner. Here and elsewhere, Denio overdubs her voice which sometimes produces, to these ears, a cloying effect. Indeed, another referent throughout would seem to be The Roches and that sort of wondrous vocal harmony isn't easily reached by studio means. Lyrically, the songs range from whimsical to fashionably political. The former can work ('Rx for Peanut Butter and Scrambled Eggs Sandwich' which provides just that) but can be problematic or overly cutesy as, in 'Rx for the Afterlife', she sings, "In the afterlife we'll be free of static cling". The political asides, no matter one's opinions, can be awkward as well. In 'Donald the Lump' (come on, you're not trying) and 'I Love This Cunterie' [sic], Trump's words from various pronouncements � relatively banal ones, considering the wealth of material available � are intertwined with music much as Reagan's could have been, and were, many, many, many times in the 80s. It's a tired trope with a really high bar for success. Those misgivings aside, the album is generally quite listenable, the instrumentation and its deployment very imaginatively (her bass is great fun) and Denio's persona in general is an approachable and engaging one. If there's too much of an NPR/Tiny Desk tinge, that's ok � it's accomplished, largely enjoyable work.